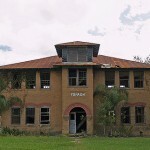 This eerie abandoned school building stood on the outskirts of Wauchula for years and years before it was finally demolished in 2008. Before it was torn down it was a favorite place for ghost hunters, as the sounds of children playing were constantly heard in the area, even when no one was around. Alas, nothing to see here anymore. We had to drive by the Popash building to go to a new job site in Wachula. Something drew me to the place, as we drove by, I would stare at the building. It took one week before our job was complete…on my last passing of the Popash building I noticed it had been in a fire…wth? When did this happen? So, I googled the place. We had driven by this building over a dozen times, and NEVER once was there any sign of a fire…until my last drive by. Weird. This school has been torn down. When was the last time the school had class? My husband and I were out driving in the country and we went by this place, and something about it just made me want to turn around and look. It was not a beautiful building really, just something there. So I begged hubby to do so and I was really lead to get out of the car and look around. There was nothing unusual about the building, but as I walked around the outside I just had a feeling I was being watched, just as if someone was looking out the windows at us and watching us. That is the only way I can describe it. I am a Christian and I know there are spirits, Paul described it well, and I definately felt something there.I cannot say it was malevolent but just there, perhaps a bit of lonlieness and sadness,is more of a feeling I felt.I just knew I had to stop and look at it. I took a picture and put it away, yes, this was before digital cameras and all. We live in St Pete so I never knew what this place was or exactly where we were. About a year ago I was looking on the web and just so happened to see a pic of this building and that there was a fire and it was demolished afterwards. I have looked at the pic since and I can still feel something , it is so strange. I actually went in there with my husband at the time and friend. He took pictures and there is something well, was something up stairs. I felt something scratch me and as we ran down the stair my husband at the time fell through. This was in 2005.